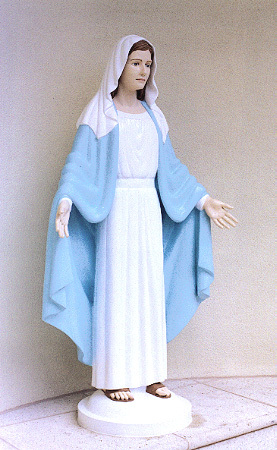 ANDRÉN & KNAPP - STATUES, "Mary - Grotto"
This life sized statue of Mary is in a grotto outside the Church of the Resurrection in Lakeland , Florida. The same church for which we did the oval relief. We also designed the grotto, which will be completed with candles and benches and decorative plantings. Normally I would not want to paint a statue in realistic colors but I think it works out in this case.